Two percent of American adults have a shellfish allergy, making it one of the most commonfood allergies in America. Less than one percent of children have a shellfish allergy, making it more likely to occur in adulthood, unlike many food allergies which typically start in childhood. Shellfish allergies are life-long once developed and can be severe for some. Everyone’s reactions are different when exposed to shellfish. Some only react to certain kinds of shellfish. Reactions can vary from mild to severe. Your doctor can do tests if you think you may have an allergy to shellfish. Severe cases can cause anaphylaxis, which includes rapid pulse, extreme dizziness, swollen throat and a severe drop in blood pressure, leading to shock. Skin test. A skin prick is done and the area is exposed to the protein that produces the allergic reaction. You will develop a raised bump at the exposed area if you are allergic. Blood test. An allergen specific IgE antibody test is done on a sample of your blood to measure your immune system’s reaction to the shellfish protein by measuring the antibodies in your blood. If you have been diagnosed with a shellfish allergy, avoiding all shellfish is the only sure way to avoid reactions. Food manufacturers are required by law to label foods with a list of common food allergens that may be present in their products. Unfortunately, there is currently no requirement to say if the food is processed in the same place where the eight common allergens are processed. If you have a shellfish allergy, you should also avoid handling or cooking it as the proteins can become airborne. Certain foods can also contain other products associated with shellfish such as fish stock and imitation fish. Be aware what you are consuming and educate yourself, so you can avoid any shellfish exposure and any reaction. Always be aware of what you are eating.And teach your kids not to accept food from their friends if they have shellfish allergy. 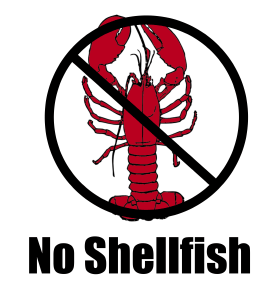 Always read labels and be aware that shellfish can be found in other products such as fish stock, fish sauce, seafood flavoring and glucosamine. You should also avoid seafood restaurants as cross contamination is very likely. If you’re eating in a restaurant that offers fish on the menu, alert your server to your allergy to avoid contamination and always ask about ingredients and how the food is prepared. If your allergy is severe, it is advisable to wear a bracelet or carry a card alerting others to your allergy in case you react and cannot communicate.